J E Lane’s new book “Passing Iniquities Down” is an emotional and telling story about overcoming life’s battles with courage and faith. 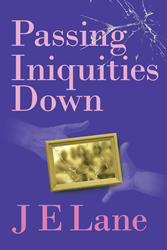 Recent release “Passing Iniquities Down” from Page Publishing author J E Lane is both enlightening and suspenseful; this prolific work of fiction explores the ideas of personal identity and finding one’s self. J E Lane, a devoted writer, artist and author, has completed her new book “Passing Iniquities Down”: a passionately crafted work that delves into the ideas of abuse, injustice, equality, and courage. Published by New York City-based Page Publishing, J.E. Lane’s gripping work aims to give empowerment to the abused and stop the abusers from hiding behind the "it was done to me" defense or justification for their wrongdoings. “Passing Iniquities Down” is a fictional story of Elaine’s life long battle with her family to reject their attempts at forcing her to accept the sins within her family, and her determination to separate herself from the practice, as she teaches the younger generation to reject the practice as well. Elaine relies heavily on the prophecies of her dead grandmother and her strong belief in her God to guide and strengthen her as she fights alone against the leaders of the family who have united against her. Although Elaine fights vigorously, eventually she tires of the never ending battle, and after placing her trust in the wrong person becomes paranoid and suicidal. It is not until the end that she looks back and understands what it was truly all about. Readers who wish to experience this inspiring work can purchase“Passing Iniquities Down” at bookstores everywhere, or online at the Apple iTunes store, Amazon, Google Play or Barnes and Noble.